Do you wonder about what your little one can see in the first few weeks of life and how you can encourage the development of baby's vision? Read on to get some tips and ideas and watch our expert's video for further guidance. Interested in some expert input on how to support your young baby's sight? Read on and get some insightful tips from Developmental Psychologist Dr. Dana Erhard-Weiss. In the first 3 months, babies can focus on objects that are 8-11 inches away. This is more or less the distance from their parents’ faces while nursing or feeding. Bold black-and-white images stimulate the development of the optic nerves and encourage young babies cognitive development without over-stimulating them. Appropriate visual stimulation for newborns is the best way to help extend tummy time. It also teaches the muscles of the eyes and the brain to coordinate and function properly. Engagement with contrasting images, diverse textures and patterns boosts infants learning and focus. What Can Babies See in the First Few Months? When you look at your newborn baby, you may think he or she is just lying passively, not doing much, but in fact a lot of learning is going on all the time! New synapses are constantly forming in this all-important period of rapid brain growth. This miraculous process needs your support. To help the development of their brains, infants need adequate stimulation. Newborns’ color perception is limited to white, black and shades of grey, because their eyes and capacity for sight are not fully developed at birth. As a result, babies love to look at high-contrast black-and-white patterns, which stand out in their blurry worlds, attracting their attention and helping them focus. Knowing this can help you offer baby the right kind of visual stimulation, which supports the development of sight, but also plays a major role in encouraging cognitive skills and focus of attention. Bold black-and-white images stimulate the development of the optic nerves. Focusing on such visual stimuli trains newborns’ vision, teaching the eye muscles and brain to coordinate and function properly. You can place objects at various distances using the Gymini’s sliding rings, thereby helping your baby practice his or her ability to focus. Place the black-and-white toys around 10 inches away from baby and gradually increase the distance as baby grows. After a few weeks, babies begin to follow moving objects. Slowly move a black-and-white toy in different directions while making sure baby’s gaze is following the movement. Visual stimulation is one of the best ways to extend tummy time. Tummy time is very important for baby’s development from day one, as it strengthens babies’ back and chest muscles, preparing them for rolling over and crawling. But practicing tummy time isn’t easy for young babies and can sometimes get quite frustrating! 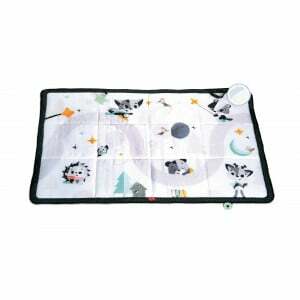 Use the Gymini’s soft book to help baby stay in tummy time a little longer. The circle within a circle image, for example, is especially easy for babies to focus on, and is therefore very attractive and engaging. In addition, the design of this image will remind baby of your eyes. The structure of the eye, with the round contour, iris and black pupil, is an area of high contrast that also draws babies’ attention. Despite their immature vision, babies are able to interpret simple images and engage with them. Engagement with images, textures and patterns boosts infants learning and facilitates a better understanding of their environment. While reaching out to a black-and-white crinkly tail, your baby feels the textures and hears the crinkly sound it produces. Gradually, baby will begin to understand that the action of touching is causing the noise. These are the beginnings of understanding the complex notion of cause and effect. 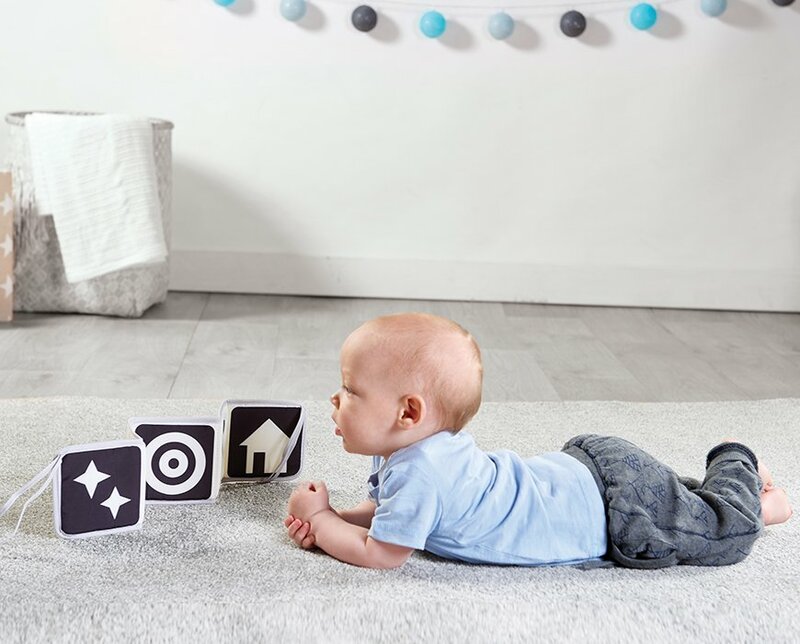 Such tactile-visual experimentations also support baby’s developing spatial perception, which, in a nutshell, is babies’ ability to perceive relationships between objects around them and better understand the visual world. Focus and attention are also an important part of cognitive development, and are possible when baby is offered the right kind of stimuli – not too much and not too little. Every baby is a little different, but research has found that simple contrasting patterns generally attract babies’ attention for longer periods of time and, at the same time, help them relax. Here are some tips that will help you offer your baby the right level of stimulation while encouraging the ability to focus. While baby is focusing on a hanging black-and-white rattle or toy, you can point to the object and name it or gently move it to produce a sound. This can help baby focus. Observe your baby. Is she looking a little restless? Is he turning his head away or seeming disengaged? If so, your little one might be a little over-stimulated. 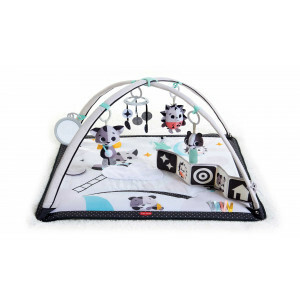 You can reduce the level of stimulation by removing some of the toys from the Gymini’s rings to help baby feel more comfortable. Today’s world is full of stimulation and distractions that can affect both parents and babies. You may feel the overwhelming impact of this reality in your own life. The clean fuss-free environment created by the black-and-white design can help both babies and parents relax and enjoy their time together.